Which toaster toasts perfectly every time? The toasters we tested varied in price from budget to premium. We put them through a series of toasting tests, ease-of-use assessments and electrical safety checks. Snapshot: The KitchenAid 2-Slice Toaster KMT2116 is a 2-slice toaster with a stainless steel + painted metal finish. Is it the best thing since sliced bread? Snapshot: The Kambrook 2 Slice Wide Slot KTA120WHT is a 2-slice toaster with a plastic finish. Is it the best thing since sliced bread? Snapshot: The Zip 430 is a 2-slice toaster with a painted metal and stainless-steel finish. Is it the best thing since sliced bread? 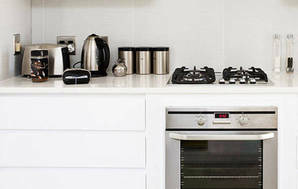 Snapshot: The Home & Co Stainless Steel Charcoal TA5722-SA is a 4-slice toaster with a stainless steel + painted metal finish. But is it the best thing since sliced bread? Snapshot: The Home & Co 4-slice Stainless Steel Pattern Toaster KST012AF is a 4-slice toaster with a painted-metal + stainless-steel finish. But is it the best thing since sliced bread? Snapshot: The Living & Co 4 Slice 1500W Stainless Steel LT4B toaster has a stainless steel + plastic finish. But is it the best thing since sliced bread? 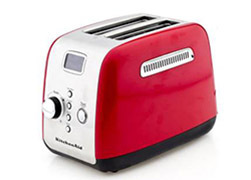 Snapshot: The Morphy Richards Accents 242020 is a four-slice toaster with a painted metal finish. But is it the best thing since sliced bread? 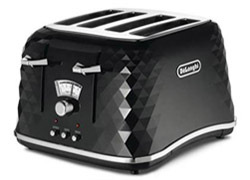 Snapshot: The DeLonghi Argento Flora CT04 is a 4-slice toaster with a painted metal finish. But is it the best thing since sliced bread? Snapshot: The KitchenAid Artisan KMT423 is a 4-slice toaster with a frozen setting and crumpet setting. But is it the best thing since sliced bread? Snapshot: The Cuisinart CPT-440A is a 4-slice toaster with a frozen setting and crumpet setting. But is it the best thing since sliced bread? Snapshot: The DeLonghi Distinta CTI4003 is a 4-slice toaster with a frozen setting and crumpet setting. But is it the best thing since sliced bread? Snapshot: The DeLonghi Distinta Flair CTI2003 is a 2-slice toaster with a stainless steel + painted metal finish. Is it the best thing since sliced bread? Snapshot: The Dualit DU2 is a 2-slice toaster with a painted metal finish. Is it the best thing since sliced bread? Snapshot: The Sunbeam Gallerie Collection TA2640 is a 4-slice toaster with a stainless steel + painted metal finish. But is it the best thing since sliced bread? If your family has a big appetite for toast and breakfast is a rush, a 4-slice toaster may be just the thing. It’s also useful when you’re loading up the toast plate for a weekend “big brekkie”. 4-slice toasters have 4 slots across the toaster or 2 slots along its length. The 4-slot models usually have separate levers for each “pair” of slots and some also have separate browning controls for each pair. The separate levers mean you can toast in just 1 pair of slots — and the separate browning controls let you use both pairs of slots to toast 2 different types of bread (or the same bread to 2 different levels of done-ness). The 2-slot models don’t usually have this advantage but they can toast wider slices of bread (useful if you bake or buy “artisan” loaves) and they’re less bulky. Most manufacturers put a lot of effort into the appearance of their toasters. We don’t rate on styling because it’s too personal. But if you’re keen to buy a toaster you like the look of, don’t forget the features you want as well. Toaster features vary a great deal — it’s often this that accounts for differences in price. Controls: These should be easy to read and operate. And they shouldn’t be close to the toaster’s hot areas. High-lift lever: This makes it easier to remove small items or crumpets without burning your fingers. Crumpet and bagel buttons: Allow you to cook 1 side more than the other. Reheat button: This is convenient but not essential — you can get the same effect by popping the toast back on a very low setting. Defrost or frozen button: Adds thawing time to the toasting cycle. It’s useful if you toast bread straight from the freezer. Crumb removal: A removable slide-out crumb tray is easier to clean than one that’s hinged. The tray should be emptied and cleaned frequently to avoid a build-up of crumbs. Construction material: The exterior should be easy to clean and have no dirt traps. Stainless steel often requires more “elbow grease” than plastic does. If safety is a particular issue in your situation, look for cool walls, cord storage, auto switch-off and a cancel button. Cord storage: The power cord can be wound around a loop at the bottom of the toaster, to stay out of reach of children and keep the bench tidy. Some models have a handy lock to secure the stored cord. Auto switch-off: If your toast gets stuck, this useful feature will switch off the elements when the time is up, even if the carriage is still down. Other toasters will turn off only when the carriage lever moves up by 1cm or so. Cancel button: Handy for quick retrieval of toast that’s getting burnt. Safe use: Toasters are fairly safe as long as they are treated sensibly. Don’t insert fingers or objects into one which is plugged in. Don’t operate them on wet metal surfaces, under low shelves, near curtains, or within reach of small hands. Remember not to shut them away in cupboards while still connected to a power point. If the exterior wall of a toaster exceeds 68°C while running, it may cause a burn when touched. This is especially dangerous for those with sensitive skin, such as children or older people. Some models are designed to keep the outer surfaces at a safe-to-touch temperature, either by the use of plastic or by insulating the walls from the toasting chamber. This is called "cool wall" technology. 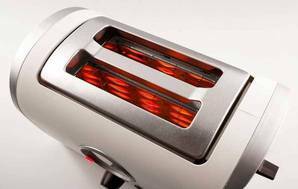 Plastic-bodied toasters are less likely than metal-bodied ones to give you a burn if you accidentally touch the sides. We asked our members about their toasters to find out which brand is most reliable.